Tetsuo has a tremendous psychic power growing within him, consuming him. Kaneda, his former best friend, the Colonel, leader of Neo-Tokyo's defence forces, and Lady Miyako, leader of a psychic/Buddhist society, all want him dead. And, if they can't kill him, it could mean the end of the world. "Akira" may be the most accessible and intriguing Japanese Manga translation that has appeared in the West. Although the story is similar in many ways to the animated film of the same name, it goes into greater depth than a movie can, spending time exploring not just the characters, but the ramifications of their actions on themselves and the world around them. Katsuhiro Otomo's work is impressive, showing a designer's eye for technical detail, and a director's cinematic sense of composition. His characters are three dimensional, and as "Akira" twists and turns towards its conclusion, Otomo binds the fate of the entire planet to the personal lives and passions of his small band of biker punks. In the liner notes of issue 1 we are told that in the 1970's Japan's comics were written for 2 general audiences. One was children to mid-teens, the other was adults. Kodansha Ltd, one of Japan's largest publishers, went after the group being neglected - high school and college students. Kodansha published a 300-page biweekly called "Young Magazine," which specialized in new trends in fashion, design, film, art, etc. In the early 80s "Akira" made its first appearance in the pages of "Young Magazine." It was presented in 25-page black and white segments. In September 1984 the first book edition of "Akira" was published, followed by a further 5 phone book sized volumes. Otomo's style is extremely cinematic. Complete with fade-ins, voice-overs, speed lines, slow motion, and even those smudgy lines lights make on video at night. The story rips along at break-neck/nosebleed speed. There is no narration - words like that would only get in the way. The only text used is in dialog balloons. The pacing is simply brilliant. There is never a hitch or a confusing move - even when jumping from a 5000 foot aerial view to a 2 centimetre close-up. The artwork itself is quick and easy - almost having the feel of industrial design or architectural sketches. Otomo is also a master of zip-a-tone patterns. For those of you who don't know, zip-a-tone is dry transfer film of dot or line patterns. Comic artists usually use it for shading effects. Otomo lays patterns on top of each other and also cross hatches on top of the stuff... and Oliff's colouring works perfectly with Otomo's shading. All of the books are full of fun stuff. Otomo obviously loves to draw planes, tanks, robots, and explosions... all in perfect, flawless perspective. But don't get me wrong, the story is not an excuse for 2000 pages of motorcycle fights, tank battles, and drug-induced hallucinations. It's all that and so much more. Otomo doesn't club the reader over the head with it, but the story does wield some heavy meaning and symbolism. I think any story about Armageddon inherently does. If you've seen and liked the film you "must" read the books. The comic is much more detailed with a lot more characters and sub-plots. Around page 144 the film and the book part ways. My favourite aspect of the story is that it starts small and keeps that feeling through all 2000 pages. First, Neo-Tokyo is destroyed, then the story grows and spirals outwards, pulling in other countries and hundreds of supporting characters. 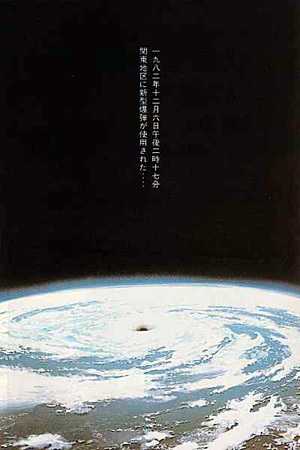 Towards the end Otomo is writing about the end of the universe, but at the core it is still a story about two friends, Kaneda and Tetsuo. Through it all the friends become enemies. They battle each other back and forth across the ruined city, amassing startling arrays of weaponry and soldiers. Oftentimes it's not clear if Tetsuo and Kaneda are truly enemies. They act the part, but in times of great stress - when either one of them is near death - they call out each other's name ... not always in anger, often like a call for help. Perhaps one of the most telling sequences: Tetsuo's psychic powers run amok during a long drug withdrawal. His body violently transforms into a mass of flesh and machinery. His consciousness flickers and reality melts. He flashes through apocalyptic visions... the birth and death of the universe... his own birth... cosmic upheaval... and then, in the midst of all these lofty visions, a simple flashback: Tetsuo's first day at reform school. He is the smallest kid on the playground. Bigger kids bully him and smash his toy. He looks up and sees Kaneda on the opposite side of a fence. They look at each other with powerful expressions of pity, shame, understanding, and resentment. Then, a quick cut to a motorcycle tire. Kaneda's tire. His bike is new, red, and the fastest. Kaneda is the leader of the gang, while Tetsuo can only follow on his second-rate bike. 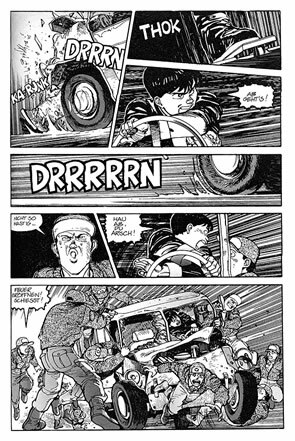 It is Otomo's ability to reconcile these small personal events with the grand worldly events in the rest of the story that makes Akira a classic. Current editor Jo Duffy is handling the translation. She seems to be doing a good job - I don't read Japanese so I can't really say. My only complaint is that she seems to be cleaning up the language. It's odd to see these motorcycle gang types continually exclaiming "Damn!" and "Blast!" But hey, I understand, this "is" America. Overall, the books read very smoothly. The colouring is by Steve Oliff, "Otomo's personal choice," we are told. Oliff and his staff are using some sort of computer process to colour Otomo's black and white work. In the back of one issue the process is described, but not very legibly: "The artwork is entered into the Olyoptics computer system utilizing proprietary software developed by Pixelcraft, by way of a scanner..." Whatever... the result is fantastic. The colours are rich and vibrant, and also - when necessary, which is most of the time - beautifully subtle. Oliff and staff manage to create smooth gradations and each page, each spread, is an elegantly designed colour scheme. The original art also has to go through a "westernisation" process. Japanese comics are read from right to left and word balloons are designed vertically. So, the pages are flipped. Consequently, some words - such as labeling on machines or street signs - print backwards. But only a few of these mistakes slip past the Epic production staff. In instances such as these, and in the case of the vertical word balloons, the artwork is redrawn as necessary. It is this attention to detail that makes these Epic editions high quality.